cup instead of a soft cup as in the past. of helmets coming off during play. the player’s head for an instant custom fit. a burden that hinders the player’s performance. 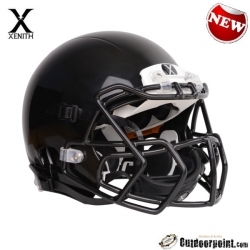 The Xenith X2E feels like no other football helmet. provide greater ventilation and visibility. We’ve all witnessed the dramatic effects from “big hits” in football. What is less obvious is the damage done by repetitive low energy hits, and those where rotational forces can do far greater damage to the brain than we fully understand. These hits account for the vast majority of the hits the average player receives. 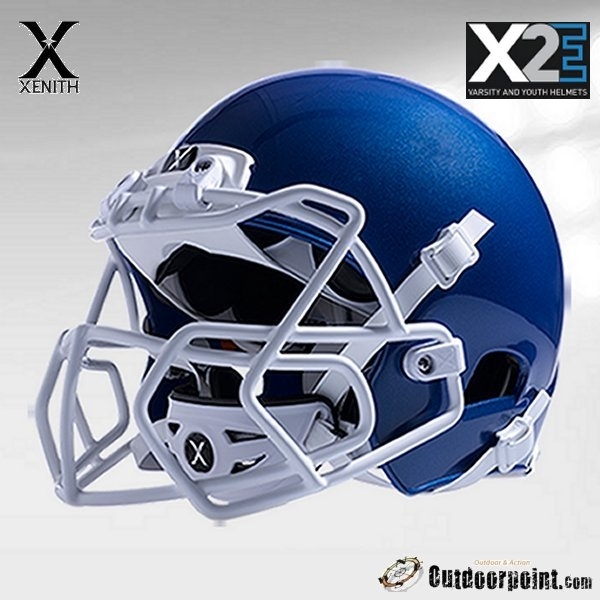 The X2E features Xenith Adaptive Head Protection® which is a system of technologies designed to address the type of hits football players receive on the field, both linear and rotational, to minimize the sudden movement of the head. Xenith’s Aware-Flow® shock absorbers “Adapt to the Hit” providing an optimal response for both high and low energy hits, and the linear forces that can cause injuries. 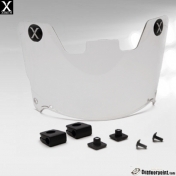 Xenith’s Shock Bonnet® acts as a suspension system, allowing the helmet shell to move independently, which helps to deflect energy and reduce dangerous rotational forces. Katso XENITH X2 kypärän sovitusvideo. 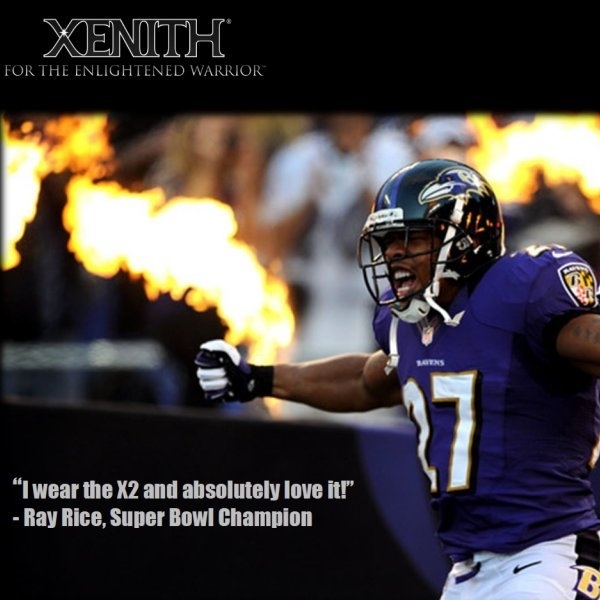 Watch the fit video of XENITH X2 helmet. Xenith was founded with the goal of reducing the risk of concussive episodes by providing both innovation and education. Xenith created an innovative product with the commitment to deliver the education needed to complement that product. When you choose Xenith, you'll see things differently. You'll become enlightened. 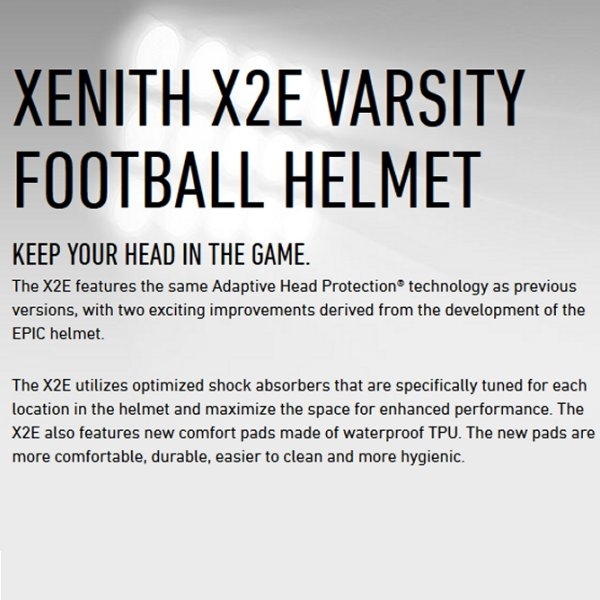 Xenith Adaptive Head Protection® is a system of integrated technologies designed to reduce the sudden movement of the head by adapting to different energy levels. It provides optimal performance when players need it most. Traditional padding materials are designed primarily for high-energy impacts. they are too dense and stiff for low to medium impacts, and cant't adapt to impact energy. This causes the head to move suddenly during impact, increasing the risk of a concussive episode. 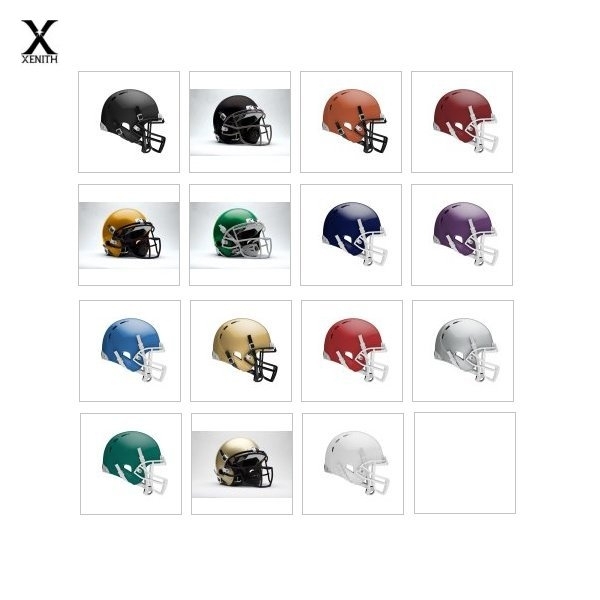 The Xenith helmet is a departure from this traditional thinking, it is designed to adapt to the magnitude and direction of varying impacts, and to provide an optimized level of compliance in order to minimize the sudden movement of the head. 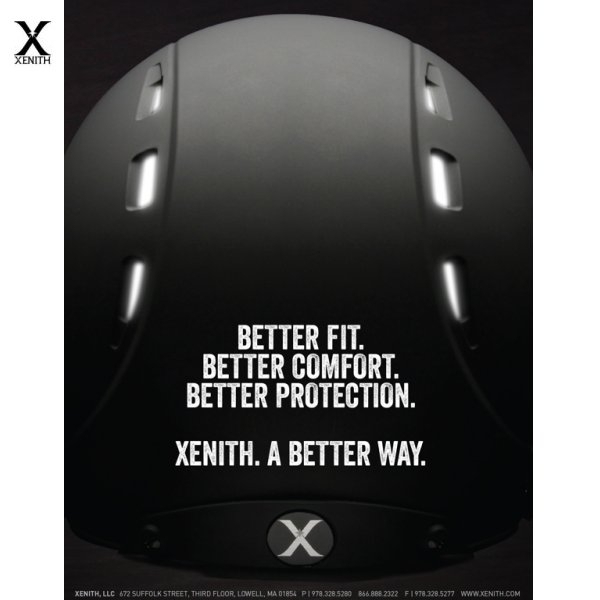 The Xenith Fit® Seeker technology adapts to the head, creating an instant custom fit, with no pumps needed, and keeps the helmet secure during impact. 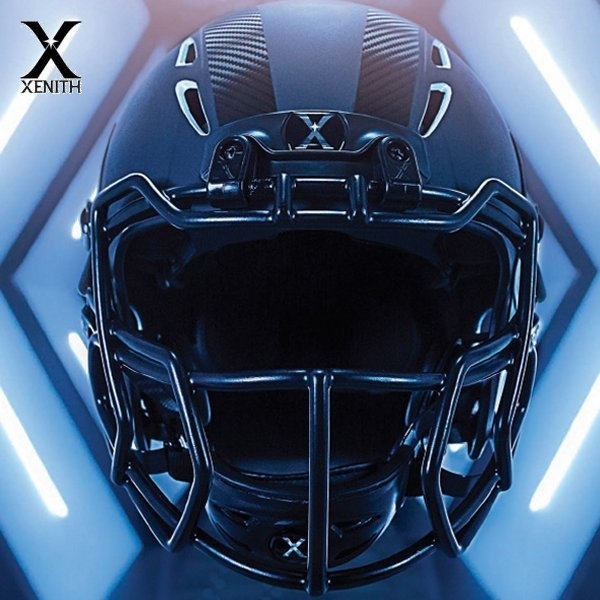 The chin straps on the Xenith football helmet are connected to the Fit Seeker® cable, which is woven throughout the flexible Shock Bonnet® inside the helmet. By pulling the chin straps out, the chin cup slides up toward the player's chin, and the Fit Seeker cable is drawn forward. As the Fit Seeker® cable tightens, it snugs the flexible Shock Bonnet® around the player's head, providing an instant custom fit with no pumps needed. The Xenit Shock Bonnet® adapts to the hit, minimizing the sudden movement of the head, which minimizes the risk of injury. Rather than relying on stiff, dense padding, the Shock Bonnet® features adaptive Aware-Flow shock absorbers that adapt to the energy of the hit, and therefore offer outstanding protection against hits. As an impact occurs, Aware-Flow Shock Absorbers begin to compress, increasing the air turbulence inside. The air is vented through a small opening, which allows for an optimized response to a variety of energy levels. The X1 was designed over 5 years and tens of thousands of impacts at the University of Ottawa Neurotrauma Impact Lab. What happens in the lab is important, but what matters most is what happens on the field. The X1 has been on the field since the fall of 2007, and has been worn by thousands of players from youth through the professional level. 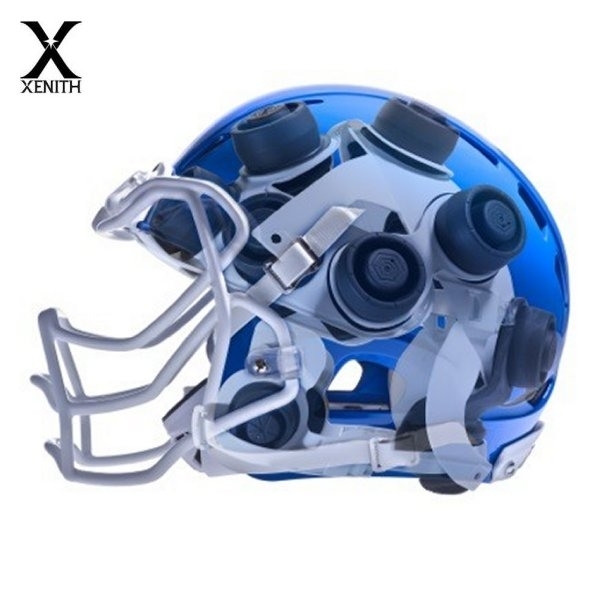 While no helmet can guarantee prevention of injury, Xenith's player data shows the X1 provides outstanding protection to minimize the likelihood of a concussive episode, and provides players and teams an outstanding experience. Visit www.xenith.com for detailed information.